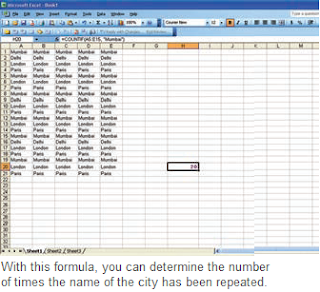 You want to determine how many times a term is repeated in a specifi c area of a table, e.g. how many times the name of a city appears in a list. You would normally use an array formula to summarize individual functions and conditions for the area. The exact defi nition of the formula depends on whether you want to differentiate between the upper and the lower cases and whether you want exact compliance with the search result. The fastest way to get the desired result is using the array formula =COUNTIF(A5:E15,‘Text’). This will fi nd and count all results containing the search term, irrespective of the spelling. For example, if you are searching for the city Mumbai, then type the formula as =COUNTIF(A5:E15,‘Mumbai’).